The Simon Fraser University Pipe Band's performance of Pachelbel's Canon on its 1991 "Silver Anniversary Tribute" studio album and in subsequent live performances by the band propelled this magnificent classical music piece into the piping world, where renditions of the piece have subsequently been performed by many bands, including the Royal Scots Dragoon Guards. However, many people are unaware of the creator of the arrangement of Canon for bagpipes, piper Dr. James "Jim" Johnson of Minnesota, and his connection with the SFU Pipe Band. In fact, Jim Johnson could be called the SFU Pipe Band's first arranger. On the 30th anniversary of its creation, we elaborate on Jim's influence on the harmonic sounds of the early SFU Pipe Band. Skye Richendrfer, a member of the SFU Pipe Band in the early to mid 1980s, met Jim during their years at Macalester College in Minnesota in the late 1970s. Skye encouraged Jim to come west to play with the Abbotsford Legion Pipe Band for a couple summers during that time and after graduation from medical school in 1981 Jim moved west to do his medical residency in the Seattle area. With his choral singing experience and deep knowledge of music theory, Jim began contributing advanced harmony arrangements of slow airs SFUPB was playing, which P/M Terry Lee enthusiastically accepted. The band played his harmony arrangement of the Welsh folk song "All Through The Night" in their medley at the 1983 World Pipe Band Championships. 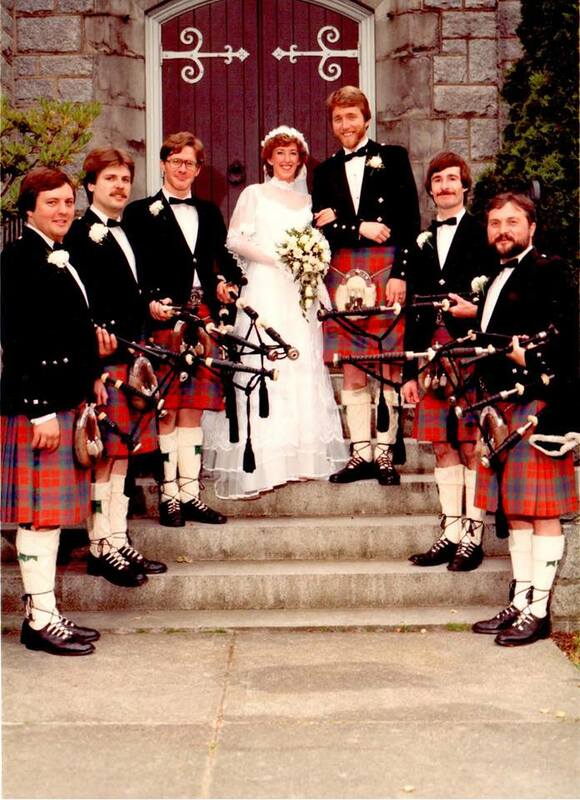 Jim had been working on a harmonic arrangment for bagpipes of Wagner's "Bridal Chorus" and on hearing a multi-track reel-to-reel recording using practice chanters, band members Alison Palmer and Jim Stewart requested Jim and four SFUPB pipers play the piece for Alison's walk up the aisle at their 1984 wedding. For the day, Jim became a member of the band, and the SFUPB quintet is captured in this post-wedding picture. During these years, Jim had also been composing many pipe tunes and copies regularly arrived in the post at my home along with handwritten personal notes on his piping and medical practice experiences. In 1988, a thick No. 10 envelope arrived with Jim's arrangement for bagpipes of Pachelbel's Canon and his notes on how he went about its transposition and arrangement and the challenges he encountered. It was a fascinating piece however, at the time, the band did not have an opportunity to use the piece. In 1991, the band recorded the "Silver Anniversary Tribute" album in SFU's Instructional Media Centre (IMC) studio for the 25th year of Simon Fraser University and Jim's harmonic arrangements for "Classical Bob" and "Setting a Course for Lewis" (performed with the Vancouver Gaelic Choir) were part of the tracks. Canon was a late addition to the tracks list and Terry was concerned about finding the right balance of players for each part and how long it might take to get a good recording. So after all the band tracks were completed in the IMC studio, he had Colin Clansey record a reduced version of the piece on multi-track in Jim Barrie's home recording studio. Since then Canon has become a favourite of band members, with the full pipe corps playing it in many performances, concerts including at Belfast and Glasgow, and recorded it again on the "On Home Ground Volume 1" album. On the band's recordings and printed sheet music, proper attribution of the Canon arrangement was given to Jim. However, others retranscribing the arrangement did not carry forward that attribution, losing the genesis of the piece. At Jim's request, the SFU Pipe Band is pleased to provide his description of the arrangement of Canon, along with two formats for the pipe music's engraving, for the enjoyment of the piping world.